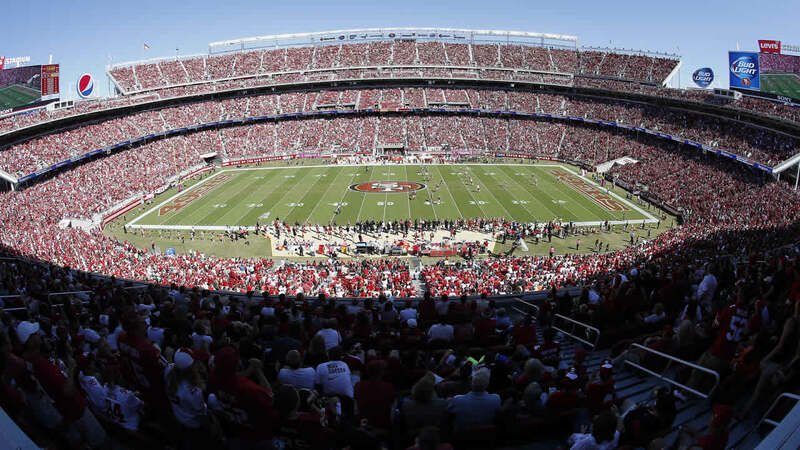 SANTA CLARA, Calif. -- The 49ers knew intoxicated fans were especially dangerous on long lines waiting to use the restroom at Levi's Stadium, but failed to provide adequate security, a lawsuit by two men assaulted last year in a bathroom at the stadium alleges. Kiran and Amish Patel say the 49ers had a responsibility to screen fans for intoxication and gang affiliation. The two cousins were attacked and seriously injured last October by two intoxicated men wearing gang symbols while waiting in line in the restroom, according to the lawsuit. The attack was recorded by a bystander. The suit was filed last week and reported by the San Jose Mercury News on Tuesday. It names the team and the City of Santa Clara, where the stadium is located, and the Santa Clara Stadium Authority as defendants. 49ers spokesman Bob Lange said the team does not comment on pending litigation. The city attorney's office did not immediately have comment on the suit. Two brothers, Amador and Dario Rebollero, were charged with felony assault in the attack. Amador Rebollero pleaded guilty and was sentenced to five years in prison. Dario Rebollero pleaded no contest. Prosecutors have called the attack unprovoked and say it began because one victim nudged Amador Rebollero on the shoulder to point out an available urinal. The lawsuit says the city failed to provide adequate restroom facilities or surveillance equipment in the restroom.